With an obligatory pessimism, but opening the door to an improvement within reach of all, so the researcher and one of the main authors of the report, Carlos Iglesias, valued the results of the fourth edition of the Open Data Barometer, carried out on the initiative of the World Wide Web Foundation. In this article we analyze the key results of the 4 Edition of the Open Data Barometer, in addition to comparing with the previous edition. In this way, we can evaluate their results taking into account their evolution, differences, progress and setbacks. Launched on May 23, the report is a global snapshot of how governments use open data to render account, innovate and achieve a positive social impact. For this purpose, an analysis of the most important trends in the publication and use of such data by governments in the last year is carried out. Apart from the different aspects of the report, which we will see below, this last edition concludes that governments are slowing down and paralyzing their commitment to the opening of data. In some cases, it has even worsened, according to the report that accompanies the statistics. Thus, the report shows that “governments are moving at a slower pace or even breaking their commitment to open data. In some cases it has even gone back on the initial progress, “concludes the analysis. But what does this exceptionality mean? The document alludes to it when it states that “most governments do not comply with the basic principles of the International Open Data Charter,” the reference used in this study, defined as a framework to incorporate the culture and practice of openness In the government, seeking its adjustment with the demands of the users. The most important recommendation of 4 Edition of the Open Data Barometer, on the other hand, revolves around the necessary investment in the opening of high quality data. Governments must do so, above all, with the data that people need, implementing open data initiatives with clear procedures, without forgetting deadlines and responsibilities. The ultimate objective is none other than to give the data an accessibility and intrinsic value for the whole world. Only in this way is it possible to have governments that see their democratic principles reinforced, as well as to create a strong, just and sustainable data economy in which the data is there for the people who need them, concludes the document. Nine out of ten governmental data sets are not open. A problem to which, according to the report, a clear recommendation can be made: “Government data should be opened by default”. Political purpose is what determines the success or failure of open data, which is why it is recommended to adopt the International Open Data Charter so that open data practices are independent of political mandates. Governments do not publish the necessary data to gain public confidence, which explains why open data portals do not contain the data that people need. Thus, an improvement would imply giving priority to this type of data, recommending “consult the citizens and intermediaries what open data they should publish first”. Open data initiatives that promote inclusion and active equality are the exception. Improving this aspect means investing in the use of open data to reinforce inclusive policies that improve the lives of those who need it most. Given that open data “should benefit everyone” and respond to what people “want” and “can use,” one of the key premises of the Web Foundation, the study concludes that in most countries this does not it’s happening. Therefore, when it comes to promoting equal opportunities, the potential of open data is not being taken advantages of. Overcoming this significant deficiency means designing data initiatives that include marginalized groups from the beginning, as well as doing it with the right approach. Among other examples, the TechMousso gender data initiative implemented in Ivory Coast or the open data website developed by the Japanese government to assist pedestrians with disabilities and the elderly are quoted. In addition to the data being “for all”, without excluding marginal or minority groups that have social significance, it is essential to offer “the data that people need”, although the trend is just the opposite. The report focuses on the data that citizens need for the government to gain transparency, such as “detailed budgets or registration of ownership of companies.” Data that, among other objectives, provide information on the use of public resources in its various aspects. In this sense, it is stressed that the trend is negative. An example could be based on statistics, only one in ten sets of data on budgets is open and, in particular, the study finds “worrying” the worsening availability of data on social policies. Above all, given the potential of open data of this type at the time of making policies to be “more effective and inclusive”. However, there is a tendency to prioritize the open data that help innovation, either by entrepreneurs or companies. The partial conclusions pointed out and the different recommendations end up converging in a great final conclusion oriented to the action. In the 4 Edition of the Open Data Barometer, it calls for further efforts by governments to reorient and develop their open data initiatives. A change of approach is required to ensure that “open data is for all” and has relevance or, in other words, that it really responds to what people “need and use”. This is a generality, made because of the poor results that are observed in most cases. Basically, the final conclusion is emphasized in the fact that, usually, “data are not open in practice”. With the aggravating fact that those that are, are not characterized as durable or sustainable, because they belong to projects that are at random from the political party in power, it is emphasized. Correct the course is an essential requirement to obtain the benefits of open data, advises the report in its last lines. Likewise, in order to avoid these problems that deserve a “suspense” to most of the countries analyzed, it is advisable to undertake actions in a determined manner. Implementing consistent measures with this approach means trying to solve the problems and tendencies observed, referring directly to the recommendations in line with the 5 conclusions mentioned above. When comparing the 4 Edition of the Open Data Barometer with the previous one we have to remember that we have already analyzed the report of its third edition, so reading both posts can be useful. Also, if we are interested in comparing specific issues between two or more previous editions, there is the option to go to the original sources through the same official page. Also, in this epigraph we will summarize the essential aspects of the third and fourth editions, to make a brief comparison; from an evolutionary approach as well as with notes on differences, methodological or otherwise, that are observed. The number of nations included, without going any further, has increased. In the recent edition 115 countries were analyzed, compared to the 92 countries covered by the previous one. Therefore, the global snapshot is more complete in this regard, thanks to this increase of 25 percent. That is, as it happened with the previous report of the 4 Edition of the Open Data Barometer, the incorporation of new countries may imply a change in the ranking that may be due to the same extension of the list. Therefore, a better or worse position should not be attributed solely to the performance of the country in question. Let’s also point out that, faithful to its methodology, the organization focuses on a ranking that does not obey criteria of perfection in terms of preparation, implementation and impact of open data initiatives, but comparative scores between countries. In the top ten we observed some important changes, although the UK continues to lead the list, followed by Canada, in the previous barometer was in fourth place, followed by France, which remains unchanged in third place. The United States loses two positions, moving from second to fourth, ahead of Korea, who is in fifth position, making a significant leap from the eighth level awarded in the previous barometer. Australia experienced an even stronger climb from the last top-10 position to a current sixth place, followed by New Zealand, who dropped one position to seventh place. 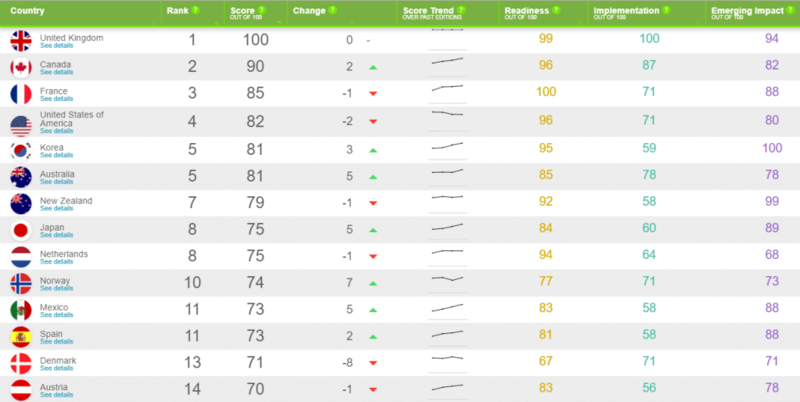 The Netherlands and Sweden come out of the top ten, before in seventh and ninth place, respectively. The eighth current position, on the other hand, is occupied by Japan, which enters this select group, like Holland and Norway, in ninth and tenth position. In another order, Spain ranked 13th in the third edition, a four-position advance if we took as reference the first edition of the report. The 4 Edition of the Open Data Barometer continues its positive trend, reaching eleventh position (remember this time within a total of 115), tied with Mexico. Leaders in each region, according to the fourth edition, are Canada, Korea, Israel, Kenya, Mexico and the United Kingdom. Results that, in comparative terms, reveal a positive evolution since “the regional champions have been improving in a continuous way since the last edition”, concludes. The complete global classifications of both editions can be consulted in the same reports, both in pdf and on the web, specifically in the data explorers of the third and fourth editions, respectively. Unlike the third edition, in the most recent few changes are observed in the upper part of the table for the Nordic countries and the United States, although the ranking may vary in terms of positions. It is also noted that a group of countries have made significant progress in their regions this year, such as Georgia, Ukraine, the Philippines, Mexico and Kenya. On the other hand, the conclusions of the 3 and 4 Edition of the Open Data Barometer are a continuum that does not bring surprises. Or maybe yes, if we expected a significant advance after spending a whole year. If last year’s report concluded that there was still much to be done, with particular reference to the importance of promoting the UN’s Sustainable Development Goals (SGD), it is still along the same lines. In the fourth report the results show, as we have seen, that open data remains an exception, and the same is true of countries that make progress. Linking with the evolution observed in the previous reports, it is pointed out that “the governments are advancing at a slower pace”, observing also regressions. The most outstanding changes over time are observed in countries that have adopted the International Open Data Charter, since this means fulfilling their basic principles, increasing the probability of becoming regional leaders in the field. Its evolution over the years is reflected in the different editions, standing out in the fourth to countries like United Kingdom, France, Korea or Mexico. The 4 Edition of the Open Data Barometer also shows continuity in the negative trends indicated. Among them, although “the impact of open data continues to be greater in terms of economic growth and the creation of new enterprises”, there is no influence on social inclusion. Also, the poor development of initiatives aimed at favoring marginalized groups still fails to take advantage of the potential of open data. Also, the results show a lower average availability of data in essential public services, detecting a “worsening in data related to health or education”.